It has been announced this week that millions of taxpayers will receive a new annual tax payments summary under a new scheme introduced by George Osbourne. This new scheme, which at least 30 million income tax payers adhere to, means they will receive an illustrative breakdown of where their tax money goes from HMRC. 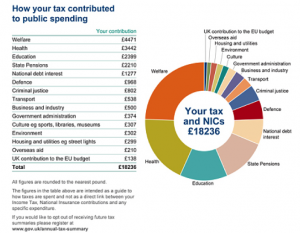 Most tax summaries, as demonstrated above, will show that the biggest expenditure, which roughly accounts for a quarter of all spending, followed by health, education and then state pensions. A person earning £60,000 a year will be told that £4,471 of their salary is spent on welfare and £1,277 is spent on the national debt interest. The state pension accounts for £2,210 of spending. 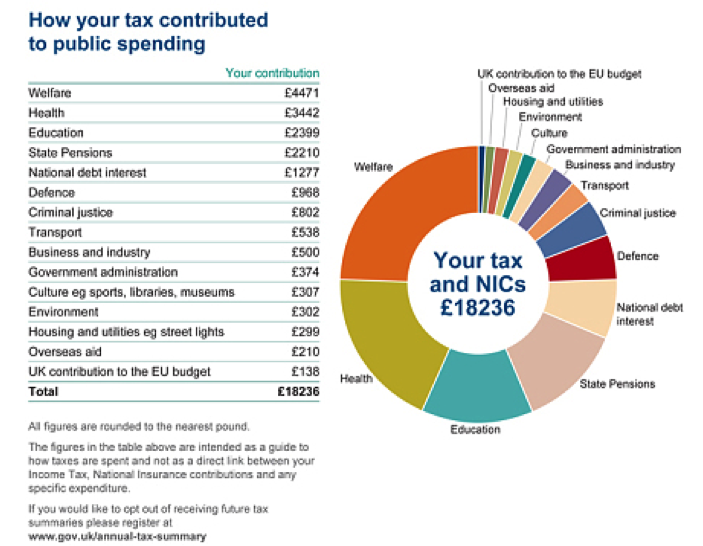 Of the taxable income, £3,442 goes to help fund the NHS and just £538 of a £60,000 salary goes to transport projects. Foreign aid will account for £210 of a person’s taxable income and £138 will go to the UK’s contribution to the European Union budget. Defence spending would account for £968 of the taxable income of someone earning £60,000 a year. Ministers have argued for this new scheme, arguing that showing exactly where taxpayers’ money is going could make voters more receptive to controversial Government measures, such as the benefits reform. Furthermore, ministers are also hopeful that if the public is more aware of how much they really contribute, they will be more inclined to vote for parties which favour lower taxes. When will you receive this? Eight million taxpayers who complete self-assessment returns will be able to access their tax summary online, while the 16 million PAYE taxpayers who received a tax coding notice from HMRC for 2013 to 2014 will receive their summary in the post over the next seven weeks. Any taxpayer who does not receive a tax summary can use HMRC’s online tax calculator to estimate their tax bill and see how it contributes to public spending.